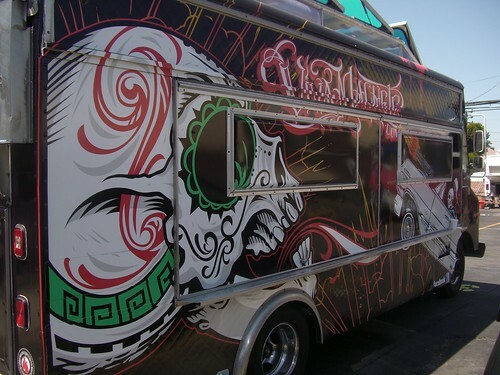 Every time I think the luxe lonchero trend has hit full cultural penetration, I find food trucks and food truck culture (yes, there is such a thing) cropping up somewhere I'd never expect. If food trucks jumped the shark with those B of A billboards, no one told Madison Avenue. According to The New York Times, food trucks are the hot new vehicle -- literally and metaphorically -- for pitching everything from ski resorts to Heinz ketchup. The notion of rolling billboards is hardly new. Here in Los Angeles, we've already seen promo trucks dedicated to liquor and under-appreciated Danny Trejo films. Perhaps the trend will finally come full circle with some bold entrepreneur embracing the "roach coach" moniker to offer al pastor alongside insect extermination. That's a killer combo.